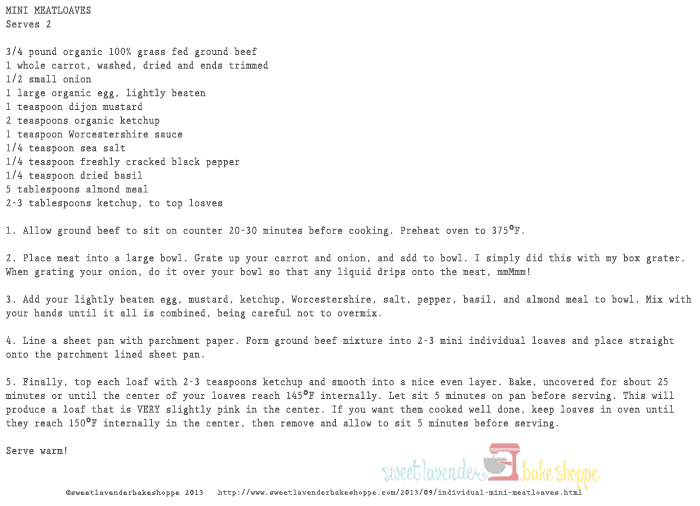 My husband and I love this recipe for meatloaf. We've made it a million times: as one large loaf, as mini loaves (as shown) and also as meatballs! Talk about jazzing up your spaghetti with marinara! We've even tried the recipe with grass fed ground bison- mmMmmm! It's most definitely our go-to, whenever we're craving the comfort food staple and we always make sure our red meat is grass fed when making. If you've never tried grass fed beef/bison, I highly suggest doing your own research into why it's so much better for you than your typical beef and try some ASAP. You will not be disappointed! True, it's a little more pricy, but the health benefits (as well as taste) make it so very very worth it. Carrie describes the health benefits as well as cheaper ways to buy, on her blog, should you want to read. My favorite part of this mix has probably got to be the ground onion. I first saw the onions prepared this way when I watched my husband's grandmother make her Norwegian meatballs, or Kjøttkaker. I was so intrigued! You get your onion, but not like chunks of it. Rather, finer little bits intertwine throughout the meat mix. You also get all of the sweet fragrant onion juices mixed in as well- which make for a very moist and delicious end result. It was totally love at first bite. I never went back to chopped onions again. 1. Allow ground beef to sit on counter 20-30 minutes before cooking. Preheat oven to 375°F. 2. Place meat into a large bowl. Grate up your carrot and onion, and add to bowl. I simply did this with my box grater. When grating your onion, do it over your bowl so that any liquid drips onto the meat, mmMmm! 3. Add your lightly beaten egg, mustard, ketchup, Worcestershire, salt, pepper, basil, and almond meal to bowl. Mix with your hands until it all is combined, being careful not to overmix. 4. Line a sheet pan with parchment paper. 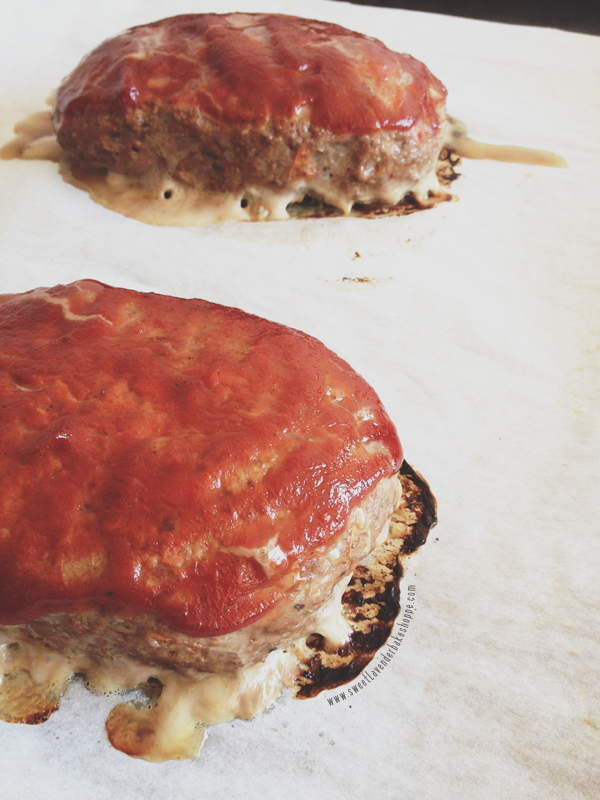 Form ground beef mixture into 2-3 mini individual loaves and place straight onto the parchment lined sheet pan. 5. Finally, top each loaf with 2-3 teaspoons ketchup and smooth into a nice even layer. Bake, uncovered for about 25 minutes or until the center of your loaves reach 145°F internally. Let sit 5 minutes on pan before serving. This will produce a loaf that is VERY slightly pink in the center. If you want them cooked well done, keep loaves in oven until they reach 150°F internally in the center, then remove and allow to sit 5 minutes before serving. So creative! They seem much more appetizing when they're small like that! Don't they? I'm convinced that anything miniature is THE BEST! oh yum! I need to print this! I am OBSESSED with meatloaf! It's such a comfort food staple!